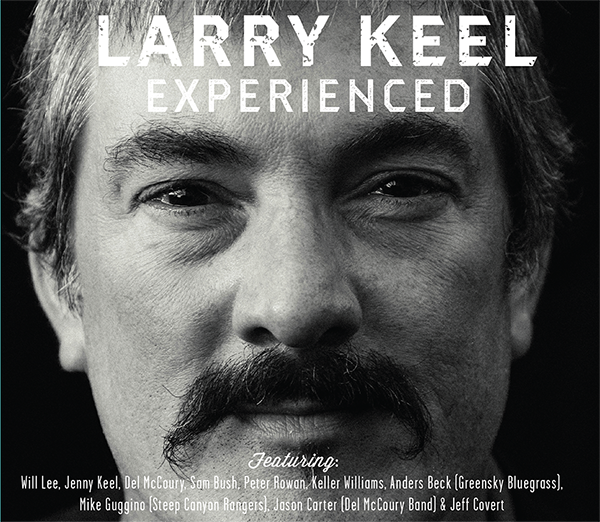 Listening to the new Larry Keel album “Experienced” is a revelation. It is a look at what music can be when stripped of preconceptions and when a blend of bluegrass, deep woods psychedelia and moonshine combine. Journeyman Keel, 48, brings his regular backing band, wife Jenny Keel on bass and banjo player Will Lee, to the fore along with a rotating cast of guest stars on this, his 15th album. Kicking off with “Ripchord,” a Will Lee composition that features Newgrass legend Sam Bush on fiddle and mandolin, this bright, happy ripper showcases the way Keel can play to the forefront of a song or fall back and allow others to take the lead as both Lee and Bush push this tune to the red line. A personal favorite, “Lil’ Miss,” is next and to those who have seen The Larry Keel Experience live recently this song is no stranger. The bass line thrown down by Jenny Keel can only be described as “slurty,” a slutty/dirty thump that really drives the song. The twangy effects of Larry’s guitar are a perfect counterpoint. “Memories” offers a somewhat wistful glance at Keel as he opines “Wake up and start another day, full of memories.” Lee’s precise banjo is a fantastic backdrop to Keel’s lyrics here, which features pleasing harmonies from Jenny. A much more traditional “Fill ‘Em Up Again” follows featuring Del McCoury on guitar and fiddler Jason Carter of the Del McCoury Band and Mike Guggino of Steep Canyon Rangers on mandolin. When Larry’s good friend Keller Williams shows up, you never know where they are going to go and on “Miles and Miles” the two continue a years-long partnership and take us on a more spacey voyage, that will be a favorite jam vehicle in live shows. The next tune, “The Warrior” has bluegrass royality guesting as Peter Rowan lends percussion to a dark song based on “The Teachings of Don Juan”. The tune takes on Mexican Indian leanings as the warrior of the song searches for knowledge. A perfect come-up from the darkness, the last song on the album, another Lee composition, “Just Another Sunny Day” will have the listener smiling and moving along to the vocals of Lee, the dobro mastery of Greensky Bluegrass’ Anders Beck and Jeff Covert (also the album’s engineer) on percussion. Keel is a flat-picking savant and those who have known him through the years have benefitted from the world at large not grabbing onto him, despite his win of the Telluride Guitar Competition and multiple appearances at major festivals nationwide. Given the right circumstances, this is the album that could attract the attention of the wider populace. It allows Keel to show his breadth of influence while showcasing his talent and that of his supporting cast. Keel couldn’t do this alone, he needed his friends and they delivered in spades. This album shows what music is capable of. It is a shot across the bow of the established view of what Bluegrass is and what it is evolving into. “Experienced” will be released February 26, 2016 and will be available at www.larrykeel.com.